While you don’t get to gaze at islands from the balconies at Phangan Island View, the spotless and comfortable rooms do come with views of a central swimming pool within walking distance of Thong Sala town and the beach. Ad Book now! Rates from US$24++. Average rating 8.5 from 389 reviews. Set in a pair of white two-storey concrete buildings with dark-wood trim on either side of the long pool, the rooms are spacious and equipped with comfy beds, desks, TVs, fridges, safes, bathrooms with hot-water showers behind curtains and glass sliding doors opening to balconies with cushioned benches. White tile floors and white walls are punctuated by single framed prints – decoration was not much of a consideration here. Even so, we felt that Island View’s rooms are considerably better than the similarly priced digs at Phatchara Boutique Hotel, which goes for a trendier style on the northern fringe of Thong Sala town. Several plastic lounge chairs rim the pool, while breakfast is served to rattan tables in a small dining area. WiFi is free and the English-speaking staff can help with bicycle or motorbike rental, ferry tickets and info on exploring the island. The location puts you just east of Thong Sala town, about a 10-minute walk from the ferry piers, making this a good choice for a night if you’re leaving first thing in the morning. It also makes a comfortable base for those who don’t need to be on the beach. 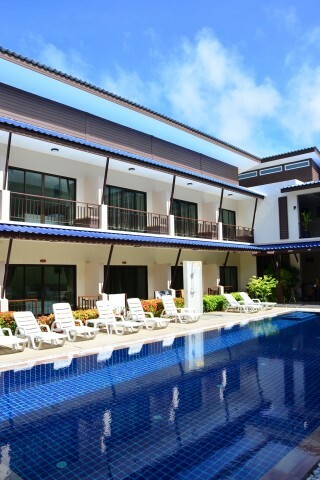 Check rates at Phangan Island View Hotel on Booking.com.